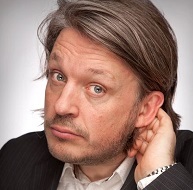 Comedian Richard Herring arrives in York this Friday to perform his new show ‘Happy Now?’ in which he examines whether people can ever be truly content and happy, in true Richard Herring style. If you are looking for a night that promises to be funny as well as thought-provoking, then this is for you! Shopping, Cowtown, c r u m b s and JUNK. London’s propulsive-bassline-and-disco-not-disco-drums-and-guitar-wranglers Shopping arrive in York for the first time, topping an impressive bill which also includes Leeds’ disco-punks Cowtown. Representing York will be local favourites JUNK and newbies c r u m b s. Get ready to party! Displace Yourself Theatre is putting on a show that’s bound to be intense as it transports you to a desolate 2044, where the world is left in a post-apocalyptic mess. This dark futuristic scenario is the backdrop for poetic text, a powerful soundtrack and an interesting, social commentary. For theatre-fanatics, this is one not to miss!